Well, this is exciting: the time has finally come! 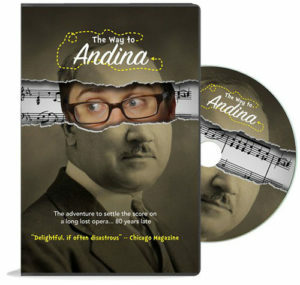 If you’d like to watch the documentary or support this project, you can now buy a DVD or watch the online streaming version. Thank you again for all your support along this journey. This year as part of my New Year’s resolutions, I’m making one short video each month. The first one was about a type of commercial I’d love to ban from the airwaves. Here’s my second video about a discovery I made that changed my mind about a very hot button political topic. It relates very closely to the opera documentary so I hope you’ll watch it. (And maybe even share it too!) I’ll send you my third video next month, or you can subscribe to my YouTube Channel to get notified earlier once I publish it. One of my favorite podcasts, Scriptnotes (a podcast about screenwriting) inspired me to add a new section to this newsletter. I’m ripping them off and calling it my “one cool thing”– something I discovered that I want to share with people. So here’s my first one cool thing: this 2 minute inspirational video called “The Gap” by German filmmaker Daniel Sax. It’s narrated by Ira Glass from This American Life and I’ve watched it approximately once a year for the past several years. In fact I just recently recommended it to a creative high school student I met at a film festival who asked if he would ever be satisfied with his own work. This video speaks to me in a very profound way, and judging by the fact that it now has over a million views I don’t think I’m the only one!